Does it feel like you’re shooting in the dark when it comes to your business? Making random guesses, instead of relying on solid figures? Do you feel lost at sea, trying to navigate the mountains of business data? Are you clueless about your inventory – what to order and how much to order? Dealing with dissatisfied customers, on a daily basis? If this sounds even remotely like you, then it’s time for your business to reconsider your ERP system. 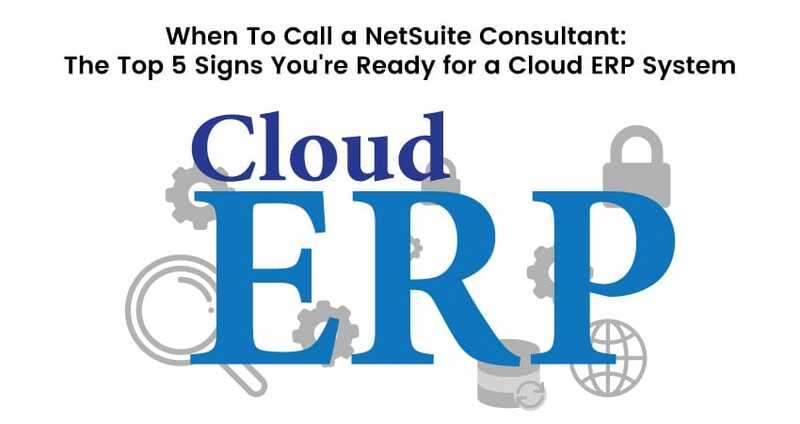 Read on to find if your business is ready to migrate to a cloud-based ERP like NetSuite. Indicator #1: You Use a Handful of Software Applications to Handle Various Processes. Pause a minute, fetch a paper and pen or open a note app on your mobile. List out all the software systems you use in your office – accounting, billing, warehouse inventory maintenance, HR and more. If you’re using different systems for various processes and interoperability is a huge pain, then it’s time you need to give a call to a reputed NetSuite Consultant. With a cloud-based ERP like NetSuite, you can easily integrate all your businesses functions on to a single database. All your staff uses one source of information that is updated in real-time and highly accurate, thereby helping them make better decisions. Indicator #2: You Get Anxiety Attacks if Anyone Asks about Information of your Business and other Data. What if potential investors asked you your business sales margin and net growth for the last few quarters? How long would it take for you to find this data? If your business depends on individual spreadsheets and old silo systems, getting the necessary is a huge task, one that is time-consuming. With an ERP system, your employees can track business data faster than ever before, and everything about your business (performance indicators, reports and more) is available at your fingertips at all times. Indicator #3: Book-keeping is taking Longer and Longer. Very often, the accounting department shows the early signs that something is wrong with your system. If your employees still rely on stone-age methods of bookkeeping like – paper-based invoices, sales orders or spreadsheets, then it means you’re wasting massive manpower on tasks that can be handled in a jiffy, by an ERP system. With an ERP system, accounting and financial staff will no longer have to spend hours crossposting, re-inputting figures and other such tasks. Instead, they can focus on delivering critical reports and other key insights that help to drive your business forward. To ensure that your business operations proceed smoothly, you have to ensure that the right products, reach the right customers at the right time. This is possible only, when inventory, sales and customer data are integrated and function seamlessly. Without ERP, it’s difficult to provide customers with accurate information. For instance, if a customer calls your sales department to check whether a particular order has been dispatched, your employee can’t track it, if sales and inventory are disconnected. This not only leaves you to deal with irate customers but also tarnishes the reputation of your brand immensely. By moving your ERP to the cloud you don’t have to spend on costly upgrades annually. Also, you don’t have to bother with patchworks and system upgrades. Everything is handled remotely at the cloud, and it’s business as usual at your end. An ERP helps you simplify and optimize all your business processes. Instead, of trying to track a gazillion different things at a time, the A – Z of your business is accessible from a single dashboard. It makes your business – responsive, agile and scalable. No need to keep on updating or moving to new software. With NetSuite, you can easily add new functionalities as your business grows. Are you ready to harness the power of the Cloud? Visit our website for further details! !